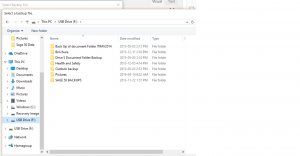 This tutorial is about opening up a backup from a USB. open you simply program to Sage 50 screen. Select Restore from backup and click OK.
Click on Browse and open the USB drive. I keep all my backups under Sage 50 Backups. 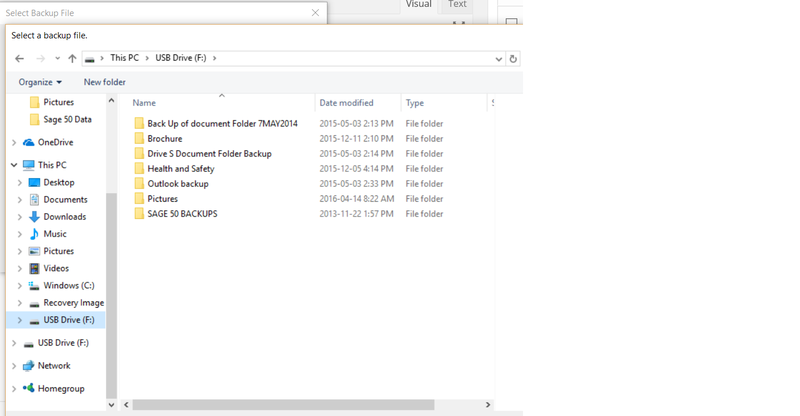 when I open Sage 50 Backups Folder I can pick from any backups and restore it. Make sure the extension is a .CAB which is a cabinet file. Your screen should look like this. With your backup file populated and you can click on Next. This screen wants you to give a destination for the backup to be restored. Click on Brows or type in the destination. Make sure you make a note of where the destination will be. You have restored your backup and Sage 50 should automatically open. At the top blue bar you can confirm the file name you choose. If you have any other questions please drop me a note. Come back for more tutorials.